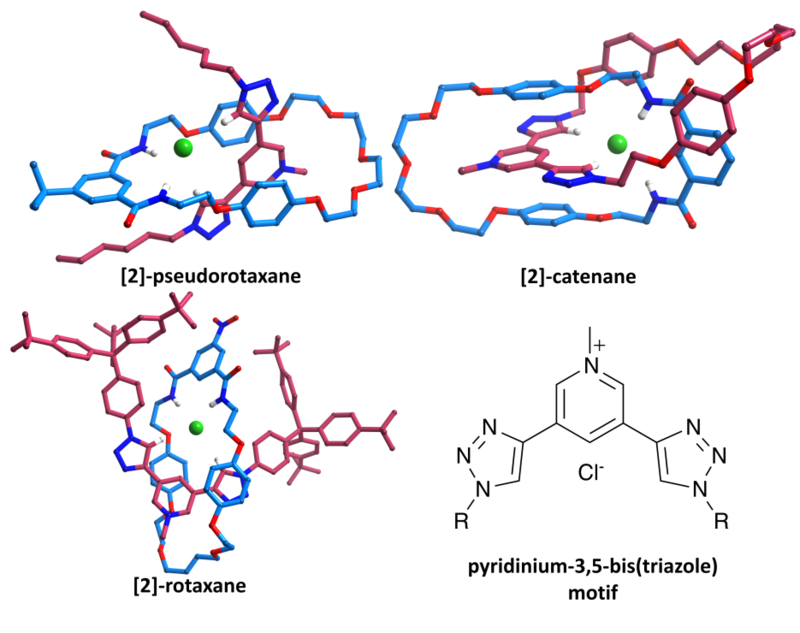 Pyridinium-3,5-bis(triazole) can bind anions through polarised C-H···anion hydrogen bonds. We have incorporated this motif into pseudorotaxanes, catenanes and rotaxanes (in conjunction with an isophthalamide macrocycle), and the resulting interlocked architectures are formed in high yields and display interesting and unusual anion selectivities. Despite the difficulties of crystallising such systems, single crystals of a pseudorotaxane, rotaxane and catenane have all been isolated (as chloride salts). Data were collected using a Nonius Kappa-CCD, synchrotron radiation on I19 at Diamond and Cu Kα radiation with an Oxford Diffraction (Agilent) SuperNova (respectively). All three datasets are of unusually high quality for such systems (final R1 [I > 2σ(I)] = 6.9-8.0%).